Children’s Easter Fun Morning is back and bigger than ever at Arreton Barns on 21st April from 9:30am – 12noon. The little ones can enjoy a whole morning of entertainment, including an Easter Egg hunt (collect three colourful counters from around the Barns then swap them for a delicious chocolatey prize) and egg decorating. Don’t miss the circus workshop from 9:45am – 10:30am where the kids can enjoy, balloon modelling and face painting as well as fun and games from 11:00am – 11:45am. To top it all off make sure they keep their eyes peeled for some special guest appearances including the Easter Bunny, Willy Wonka and others. Entry for the Easter Egg Hunt is just £5 per child, with profits from this going to Beaulieu Respite. No need to book, just turn up on the day! 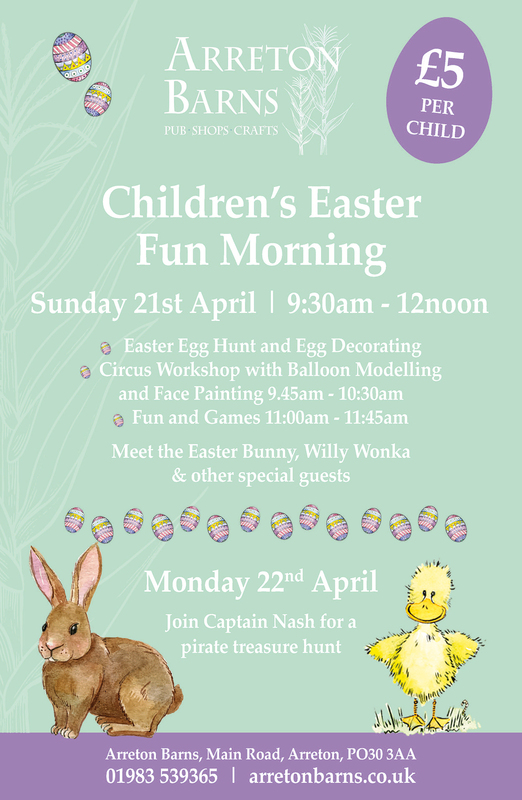 Be sure to come back on 22nd April from 10.30am – 3.30pm to join Captain Nash for a swashbuckling pirate treasure hunt right here at Arreton Barns, only £3.50 a go. Come dressed as a pirate, mermaid or princess and save £1.